The course staff are always extremely encouraging, enthusiastic and push you to your full potential. Rebecca was part of the winning group of the 2017 Hawkins\Brown live brief competition, resulting in paid internships at Hawkins\Brown practices. 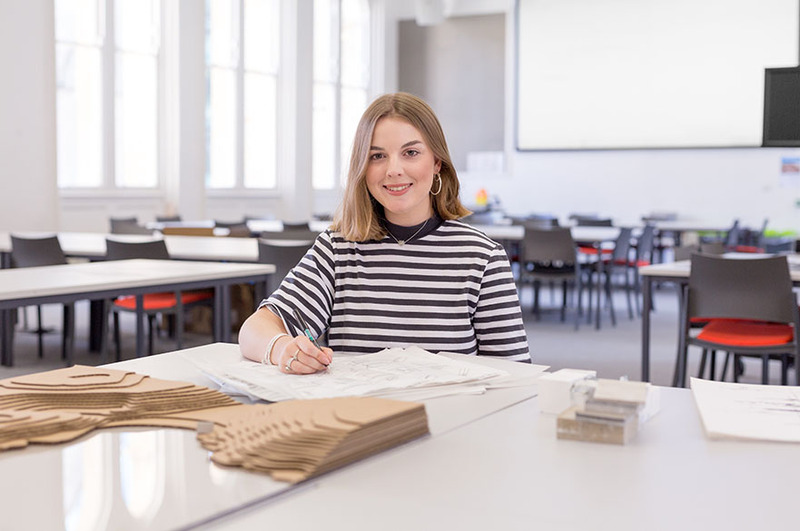 “Interior Architecture and Design bridges the gap between an interior design and architecture course, and I enjoy how we are taught to think about the built environment as a whole. I enjoy the challenges of the course; the modules we are taught are diverse and accommodate each individual for industry. “The course staff are always extremely encouraging, enthusiastic and push you to your full potential. We are always encouraged to be creative within the studio module and this style of learning has been extremely important to my development, particularly towards my final major project concept. The fact that many of our tutors still work in industry from both interiors and architectural backgrounds is extremely helpful, as we are able to maintain a connection with what is occurring within the industry today, making everything I do within my studies current, which is invaluable. “I was able to work on a live brief for the Hyson Green Library set by Hawkins\Brown. This allowed me to work as part of a team and collaborate work, while also merging with other year groups. The creative process within the group was extremely enjoyable, as we could put our own style upon the brief and develop as a team before professionally presenting to the client (Hawkins\Brown) and a panel. Presenting to a client was enjoyable and challenging, but created an opportunity to develop individually and represent NTU IAD, which was amazing. The feedback we received was positive and added to industry experience and I feel very lucky to have been a part of it. “My placement year was undertaken at BDP Manchester, where I worked on large scale projects within sectors such as healthcare, education and leisure. As part of my placement year I worked within a multi-disciplinary team and assisted with BIM-led projects, where I was introduced to Revit. Daily, I would work within the interiors team alongside architects, designing and modelling bespoke furniture and developing the look and feel packages for the client, who I often presented to. I also assisted with visualisation and renders, with some visuals projected within the public realm to present the developed scheme.